I think I’m reaching new lows here with the mirror selfie. Apparently if I have time to document my projects at all, the best I can do is with a cell phone selfie. But since the point of this blog is just to be a diary for myself of my projects I’m going to go with it. Project recorded! 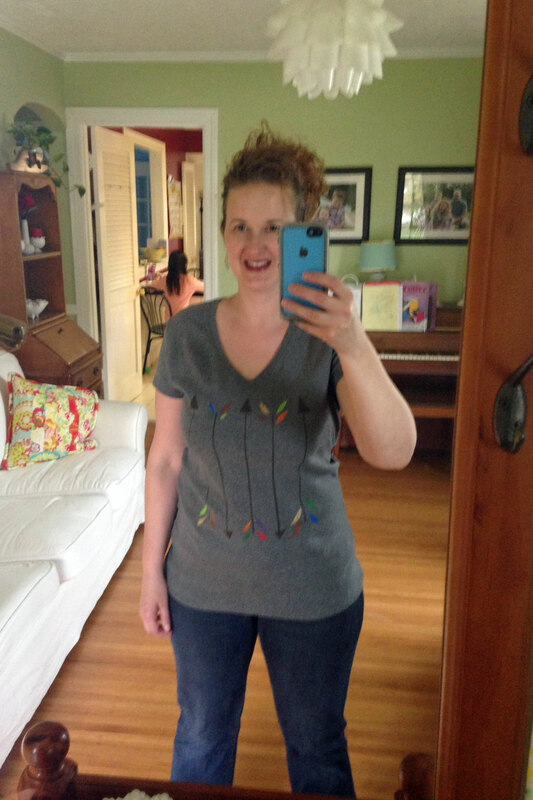 I bought a plain gray t-shirt at Costco and embellished it with a freezer paper stencil. I’ve used and loved freezer paper stencils before (t-shirts for the kids, a bat table runner, Worth’s pocket friends come to mind immediately) but never used the technique to make a shirt for myself. I was downloading some feather and arrow embroidery files for another project (check them out if you are on Pinterest) and I got to thinking that feathers and arrows are kind of like the new owls and chevrons but I like them better. Which led to me thinking that maybe I needed some cool feather and arrow stuff myself, but all the embroidery files for my machine are a little small for adult apparel, and then I thought that maybe I needed to spend $100 buying cool feather and arrow fabrics on Fabric.com (because, you know, it’s like Target–you can’t ever check out with less than $100 even if you only needed one thing), and then I decided that maybe I should just try to use fabric paint and save my $100. And so I did. 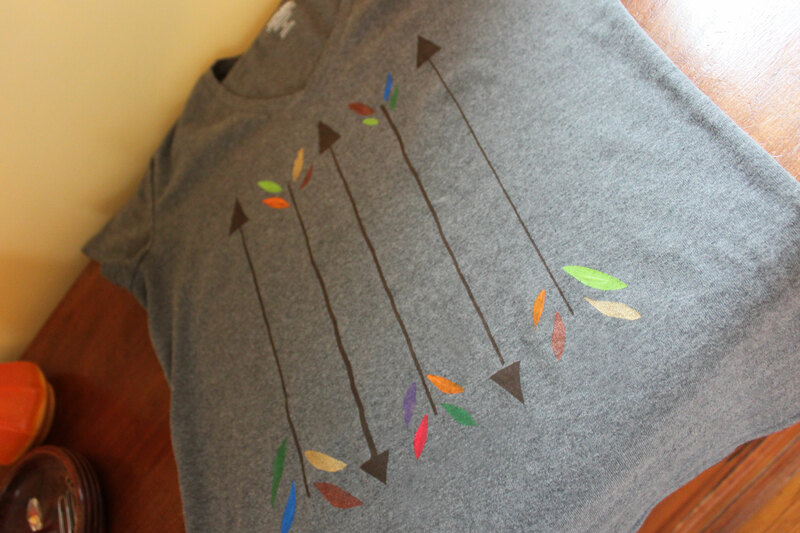 I used an Xacto knife and straight edge to make the arrows and just freehanded the rest with the knife. I’m not very artistic when it comes to two dimensional stuff but feathered arrows aren’t too complicated. I used the multi-surface Martha Stewart craft paint and the kids’ paint brushes to fill in my homemade stencil, and that was that. I’m pleased with the shirt and the stencil is still intact after peeling it off, so I think I may put my design on a tote bag next. I went on a hat-making binge at some point after the holidays. It felt good to complete small projects, and to keep my fingers busy near the fire or in other warm and snug places. Most of them did not make my blog. I rounded up a few this morning, and had some other snaps on my phone of others that have since gone to new homes. Several of these hats are from the book Lace One-Skein Wonders, which I really love. I think it may be my favorite of the One-Skein series. I’m not sure more of the patterns aren’t up on Ravelry, though it’s still a newish book, having been published in 2013. 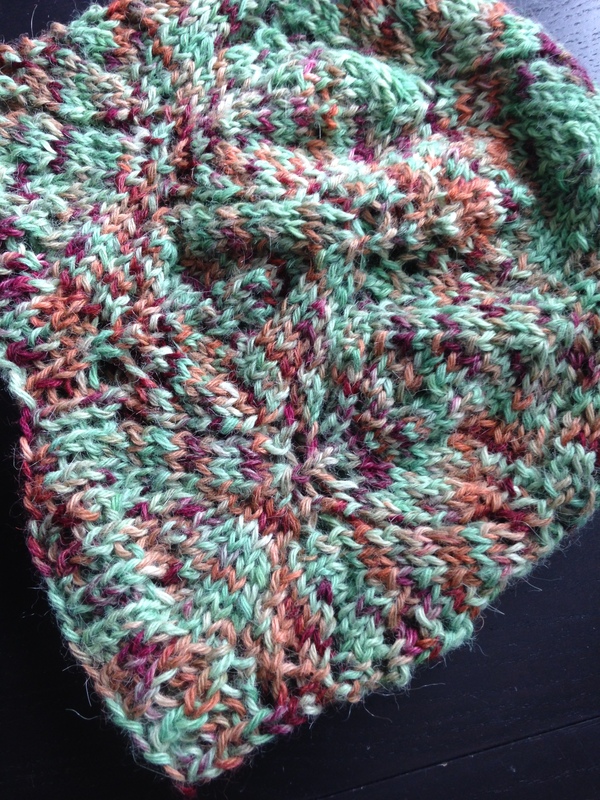 This hat is based on the Lacy Liberty Wool Hat from that book. 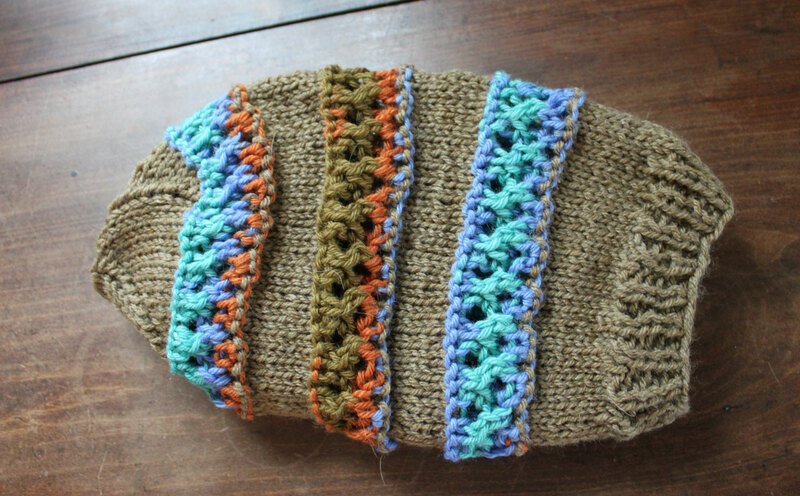 I modified it to use bulky-weight yarn, because that’s the yarn I had that I wanted to use. This hat is for a friend. Sorry about the bad phone pictures again! 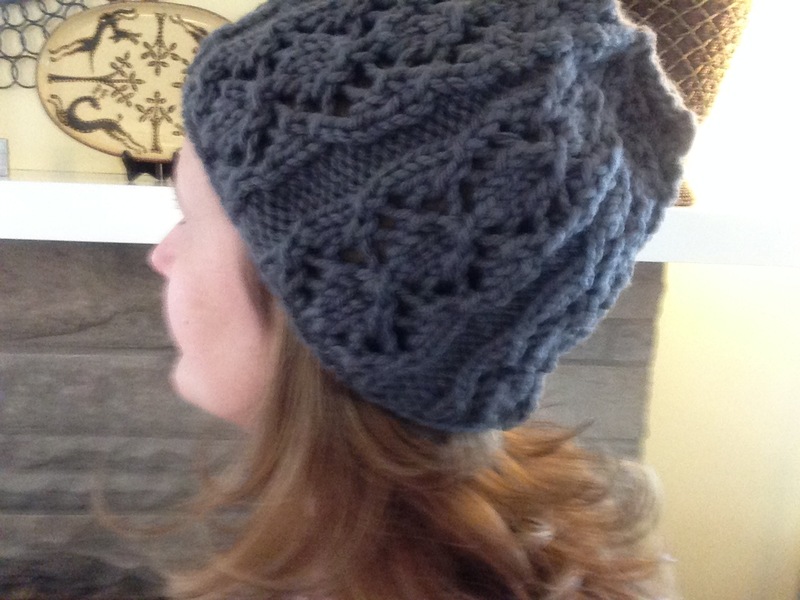 This was the same Lacy Liberty Wool Hat, this time in a gray bulky yarn. I liked it so much in the green and it worked up so quick I decided to do it again. I modeled this one, but gave it to a another friend. Isn’t the pattern pretty? 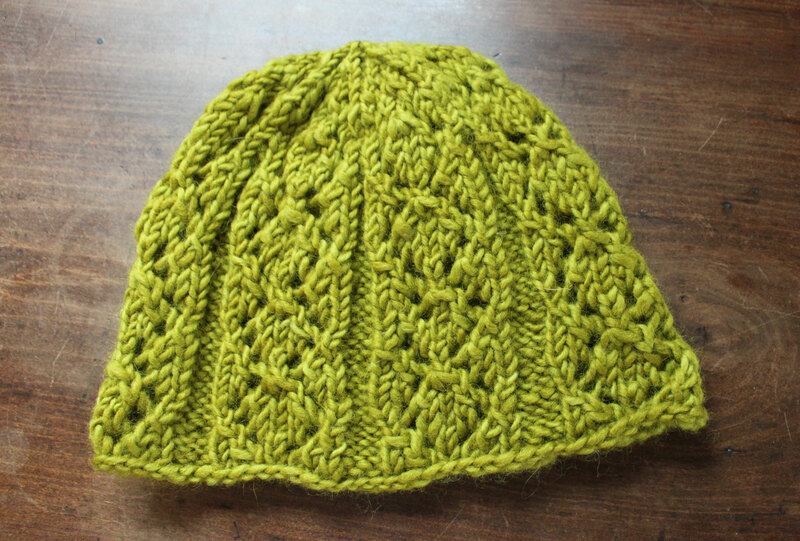 I think it’s such a nice lace pattern for a hat, and I actually really like it in the bulky. This was another gift hat from the same book. It’s the Tredegar Hat. It’s blocked over a plate, so it has kind of a tam shape with a flat part on top. I made it out of a yummy alpaca in a pretty green with copper and dark red accents. It’s for a beautiful young lady with long, curly reddish hair who is going away to college somewhere cold. This hat looks like it was just made for her–because it was. 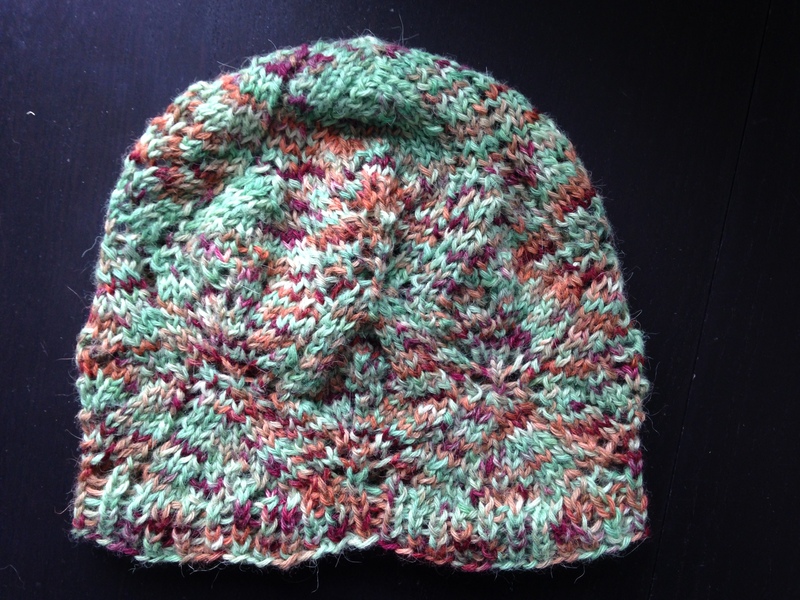 This is the Etta Hat from the same book. It’s for me, though it is being modeled here by a rather unwilling five-year-old boy. (Good sport, he did it anyway.) I lost this hat a few months ago and it never turned up. I loved the yarn so much, but only had a small amount left. I decided to use it as contrast for this hat. I liked the shape of this pattern, though I don’t really love the contrasting lace. 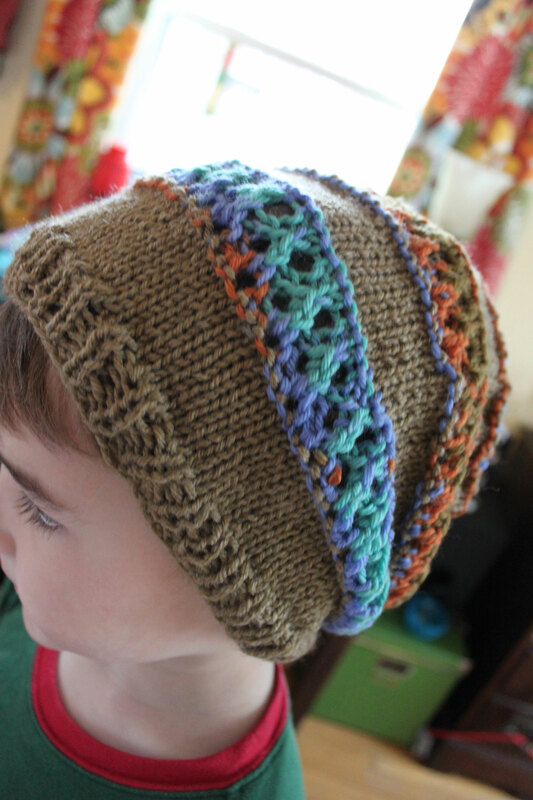 The yarn was so pretty–it really wanted to be a hat all its own. Sigh… I may do this pattern again some time in a solid color. 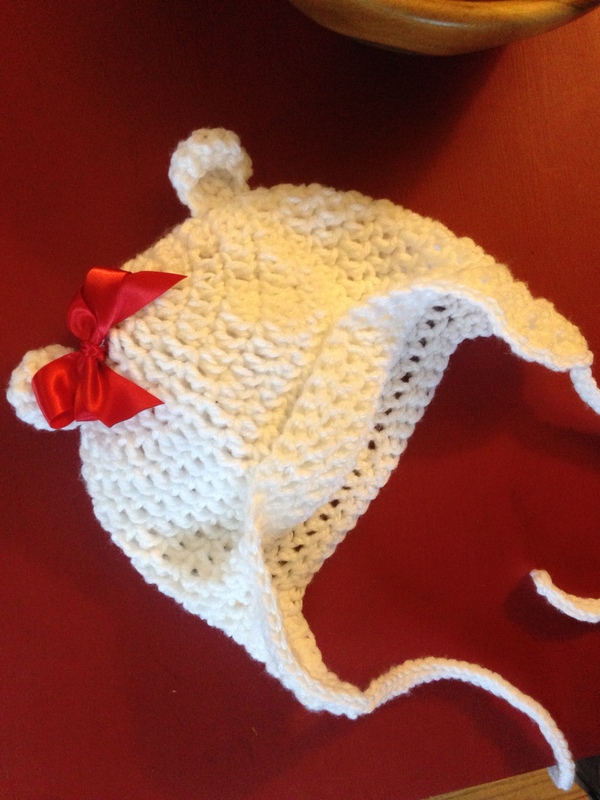 And finally, this is a Sarah Zimmerman hat I crocheted for Daphne for a Valentine’s Day gift. I realized on February 13 that I had picked up small little things to surprise my older loves, but had nothing for my toddler. 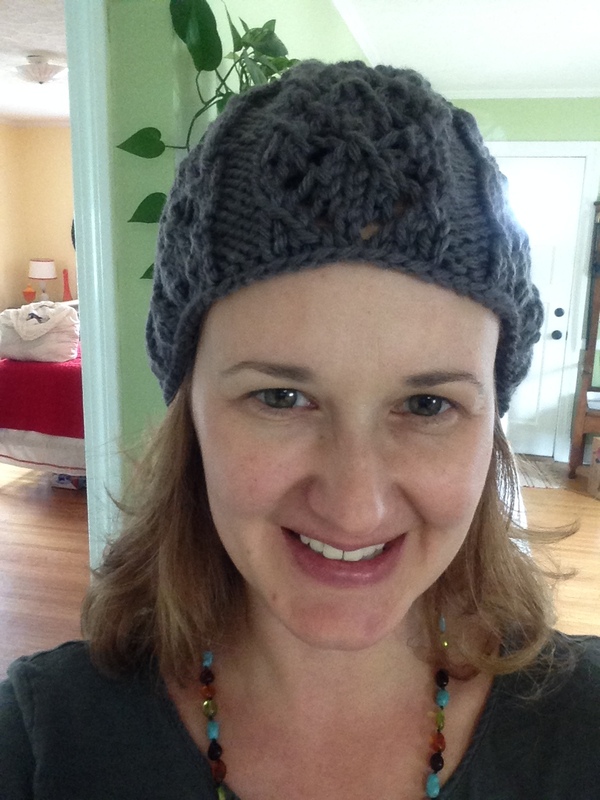 Fortunately, it doesn’t take long to crochet a hat in bulky yarn! I made this in a size up because Daphne has kind of a big head, and I wanted her to be able to use it next year. It was a little too big, so I tacked up the brim with some basting stitches I can remove later. Daphne growls when she puts it on, which is the best part.